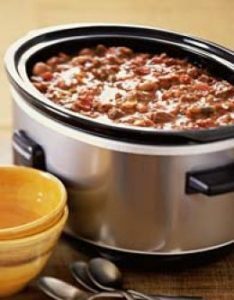 Crock pots take a while to warm up (almost an hour on high to even notice in some cases). Plug in a 7 quart slow cooker, set it on high, and pour in the large can of tomato sauce to get things started. Add about half a can of water to the mix; you can add more water later if needed, but be a bit stingy upfront, because it’s not so easy taking it back out if you over do it. Add both cans of black beans to the mix as well and give it a gentle stir. There’s no need to keep watch over the crock pot, they don’t boil unless you leave them on high for 9 hours or more and even then, it’s barely more than a hardy simmer. Time it one day if you’re curious (I’m lazy about that sort of thing). While the crock pot is warming, you’ve got plenty of time to work with the ground beef. Divide it into a pair of fairly equal portions. You’ll be working with them one at a time. As the first pound of ground beef is starting to brown in your favorite stir-fry pan, cut up your onion and peppers. You may want to only use half of your pepper supply up front. You can always add some more in later if you want the chili to be hotter or more spicy. Dice one of the large tomatoes as well. Once the beef is fairly brown, drain the excess grease and return it to the pan. Don’t overcook the ground beef! Add in the ingredients you’ve just chopped and give it a good stir and toss. Allow some of the freshly chopped ingredients to cook a little bit with the beef, but don’t overcook it. Add the Lawry’s Seasoning Salt and repeat the stir and toss part. Lastly, stir in the Sriracha Wing Sauce. Do the stir and toss thing one more time, then let it sit to one side off of the heat. The meat will soak in all the flavoring that you’ve just added. While the first pound of ground beef is sitting off the heat and to the side, work your way through the list of spices. Mix them in a Ziploc bag so that you can get a thorough blend of the ingredients. Remember that you’ve already used the Seasoning Salt and the Sriracha Wing Sauce. You don’t need more salt and you don’t want to make putty; this is a dry mixture. Once you’ve got those ingredients mixed, pour the previously cooked burger into the crock pot and give it a gentle stir. (You’re not whipping butter… you’re blending. Take some pride; be delicate!) Wash the stir-fry pan and wipe dry. You’re ready to make magic with the second pound of ground beef. While it’s browning in the pan, add half of the mixed spices in the Ziploc bag to the crock pot mix and stir (gently). When the ground beef is nearly cooked, drain the excess grease and return it to the pan as before. Stir in the remaining spice mix from the Ziploc bag. Pay attention to how much your adding. You don’t want things to totally dry out in the pan or a lot of the spice mixture will stick to the pan rather than be absorbed into the meat. Add what you don’t need for the meat to the mixture in the crock pot. Remember not to froth up a layer of foam when you stir. Blend, don’t beat. No sloshing! Once you’ve blended the spice ingredients into the second pound of ground beef and let it stand off of the heat for about 5 minutes, you can add it to the crock pot and stir. (Hopefully, you’ve maximized your stirring skills at this point.) You should have 3 large tomatoes left on the counter. I like fresh tomatoes over canned and I’m willing to bet that you’ll notice the difference. Dice two of them and add to the crock pot mix. I don’t know the size of your tomatoes and everyone’s vision of large is… well, their own private vision of large. You may need the 4th tomato; you may find that you only need one. Best to have it an not need it, than need it and not have it. Mama always said that for some reason. She wasn’t a hoarder, just in case you’re wondering; she just just lived through the Great Depression and never threw out anything that could be used in within a reasonable amount of time (10 to 15 yrs). By this stage, the crock pot is set. Make a judgment as to whether or not you need to add a little bit of water. If you add, be careful how much you add. You can always add more, but we don’t have a can of tomato paste on the list in the event you add too much and the chili gets thin. Tomato paste is the answer though and mama would have had one in the cupboard. If you’ve added too much water and things get a little thin, tomato paste is your friend. Depending on how liberal you were with the peppers, especially the jalapeno, your chili may be spicy or mild. The fresh jalapeno turns up the heat nicely, or you can pull out an old standby – crushed red pepper, if you need to add a little more instant heat. Let things cook for about 3 hours before making a call on the level of heat. The longer it cooks, the more the peppers do their thing. If you want to slow cook and really let the flavors emerge, bring it to a high heat (2 to 3 hours) and then turn it to low heat for 2 or 3 more laps around the clock face by the minute hand, stirring gently every 30 to 45 minutes. I hope you enjoy the recipe. Let me know how yours turns out.